Governor George Grey oversaw the capture of a Pai Mārire (Hauhau) pā at Weraroa, near Waitōtara, which Lieutenant-General Duncan Cameron had refused to attack with British troops. Pai Mārire, a new religious faith, sprang up in 1862 as a sequel to conflict over land in Taranaki. Local civil wars broke out between factions within iwi supporting and opposed to its spread. Many Europeans viewed Pai Mārire as anti-Pākehā and synonymous with violence. After fighting in Waikato and Bay of Plenty ended in 1864, Grey was keen to make further use of British troops before they were withdrawn from New Zealand. Defeating Pai Mārire in Whanganui–South Taranaki would enable the occupation of land at Waitōtara. In Waikato and Bay of Plenty, Cameron had learned the hard way the risks involved in attacking modern pā built to withstand artillery fire. In South Taranaki he adopted a cautious approach – no pā were to be attacked and his force kept to the open country near the coast. The Pai Mārire leader Te Ua Haumēne allegedly nicknamed Cameron the ‘Lame Seagull’ because of these tactics, with which Grey was unhappy. For his part, the general was no longer willing to be used by the colonial government to acquire land for Pākehā settlers. Weraroa, high above the Waitōtara River, was the base for a Māori force of up to 2000 that gathered to oppose Cameron’s advance in January 1865. Māori fought in the open at nearby Nukumaru (January) and Te Ngaio (March) and were defeated. When Cameron made no attempt to assault Weraroa, his relationship with Grey collapsed. Cameron resigned his New Zealand command and left the country in August. By July, Cameron’s tactics seemed to have paid off. Weraroa had lost its strategic significance and the small remaining garrison appeared willing to surrender. Grey, never one to miss a PR opportunity, accompanied a mixed force of Māori, volunteer cavalry and Forest Rangers who entered the pā on 21 July. In early September 1865, Grey announced peace in Taranaki – and the confiscation of large areas of land for European settlement. 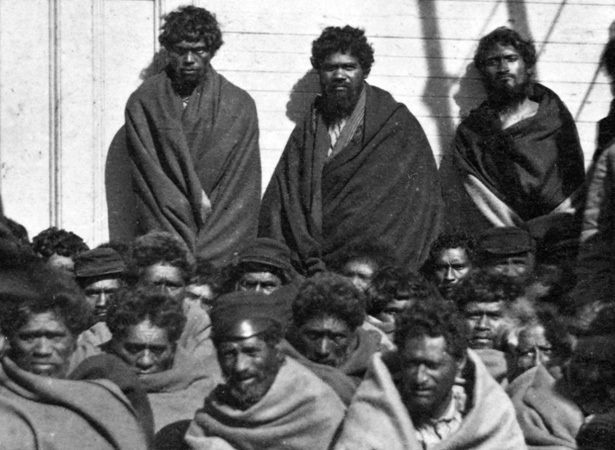 We have 5 biographies, 4 articles, related to Capture of Weraroa pā.